JEB Pro Floating provide more flexibility than individual builds, and can be distributed to many users within an organization. A floating build licensed for N seats will allow N clients to connect to it concurrently. When a client leaves, its seat is vacated, allowing another JEB client to start by connecting to the Controller. JEB Clients regularly probe the Controller to determine whether or not they are allowed to run. The check is based on the number of seats available in your licensed build: for example, a floating license for 5 seats allows 5 different users to run JEB concurrently. Additional Controller-specific command-line flags (--interface, --port, --protocol) are detailed later. After starting the Controller, follow the prompt: You will asked to input your password, accept the license agreement, and generate a license key. Hello Nicolas Falliere. Set up your JEB controller by generating a license key. This one-time operation will only take a few seconds. If you need to customize the Controller's address or protocol, you may now stop it with the Ctrl+C keyboard command. As can be seen, by default, the controller is listening on port 23477 on all interfaces, and uses the HTTP protocol. This can be changed by editing the configuration file bin/jeb-client.cfg and adding entries: .ControllerInterface, .ControllerPort, and .ControllerProtocol. Protocols currently supported are HTTP (0, the default) and HTTPS (1). 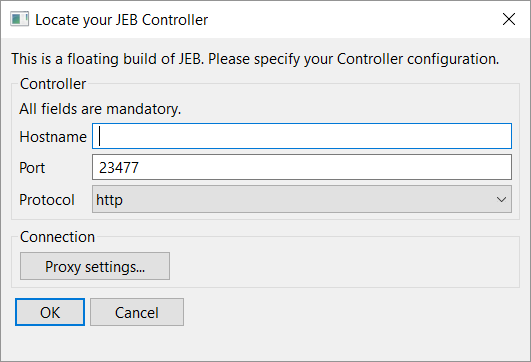 Your JEB Client settings should mirror your Controller settings: specify the controller hostname/interface, port, and protocol, in your client's jeb-client.cfg. The first time you start your JEB Desktop client, a dialog box will request you to specify your Controller's location. You will also have the opportunity to configure your proxy settings, if you are using one. JEB Clients as well as JEB Controller are the same binary file: there is no separate package for the Controller. The --controller flag is only available for Floating builds. The Controller should be started before Clients. Clients regularly contact the Controller. Therefore, the Controller should always be reachable by running instances of JEB. In order to minimize potential problems due to network latency, it is recommended to run JEB and the Controller within the same local network. By default, the Controller listens on all interfaces, on port 23477. This can be changed by setting the .ControllerInterface and .ControllerPort values in your configuration file. The controller property '.ControllerMessage' is used to provide messages, visible by clients on the Controller portal.